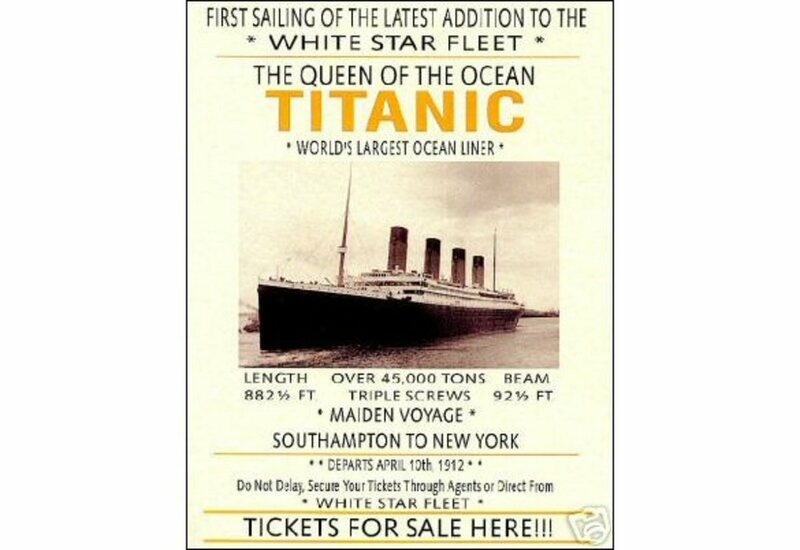 On April 14th 1912 the most luxurious passenger liner on her maiden voyage from Southampton to New York hit icebergs and sank in less than 3 hours later. 1,500 people lost their lives. 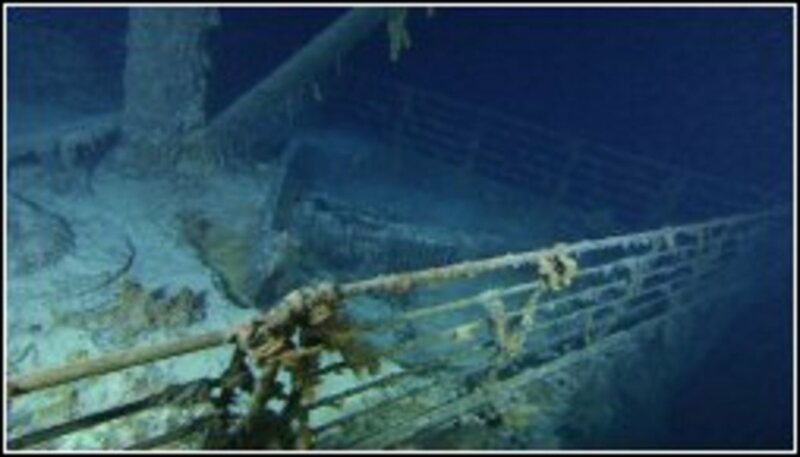 The Titanic sank in Canadian waters, about 400 miles off the coast of Newfoundland. Had the icebergs warnings that had been radioed to the ship been forwarded to the Captain, the catastrophe may never have occurred. If just 2 messages that came into the radio room had been transmitted to the Bridge, Captain Smith would have most certainly stopped the ship. 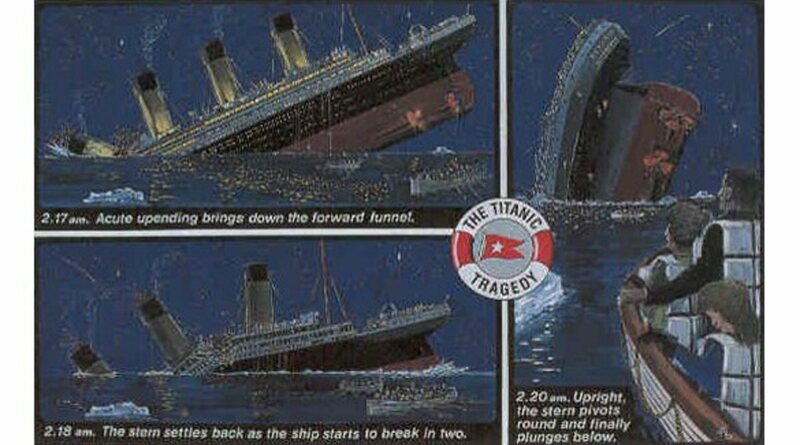 Instead the Titanic hit an underwater Iceberg spur that caused a 300 ft gash along the Starboard side. 2 Hours and 40 minutes later it had completely sunk. 1500 people died in the freezing icy North Atlantic waters. There were not enough lifeboats on board. The RMS Titanic Disaster created the Birth of the US Coast Guard and International Ice Patrol. In 1912, no system existed to guard ships in the Northwest Atlantic Ocean against the perils of floating ice. 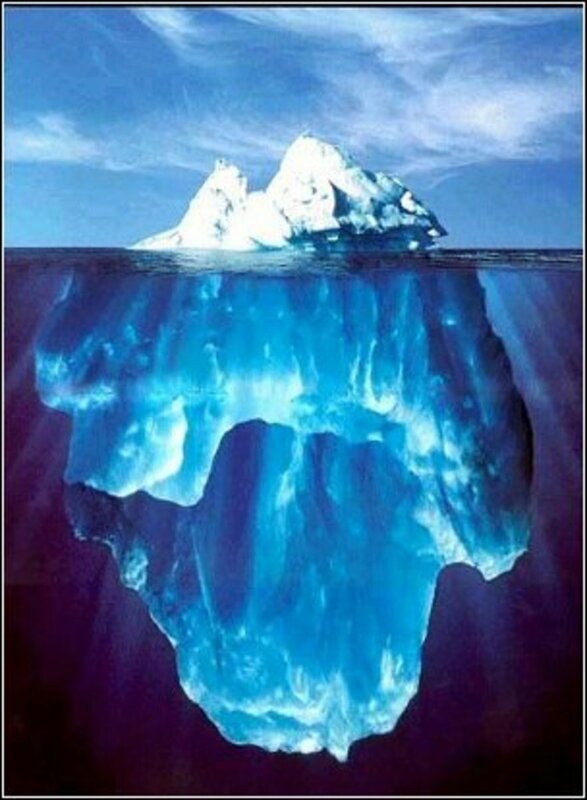 ~~ The Titanic sank well below the Arctic Circle. Actually it sank 1000 miles due east of Boston Massachusetts. (42 degrees North), about 1000 miles due east. However, the Arctic was the SOURCE of the iceberg. Representatives of the major maritime nations thoroughly discussed the subject of patrolling the ice regions at the first International Conference on the Safety of Life at Sea (SOLAS), which convened in London on November 12, 1913 as a result of the Titanic disaster. The Titanic was by no means the first ship to go down by hitting an iceberg. But it was the greatest accidents in terms of how much human life it cost. In 1907 J. Bruce Ismay President of White Star lines and Lord Perry Chairman of Harland & Wolff discussed their plan of construction for 3 ocean liners the Olympic, the Britannic and the Titanic. 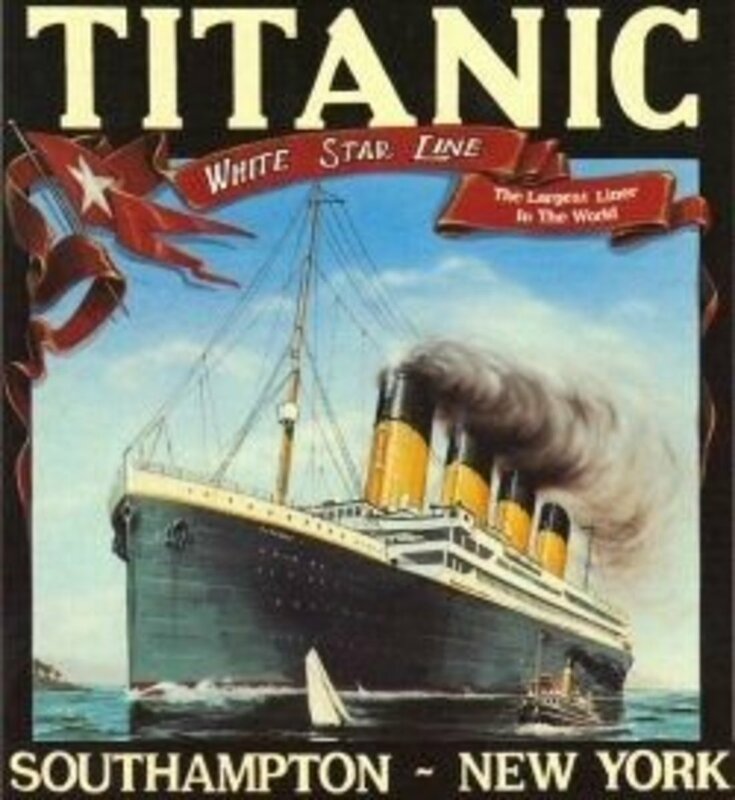 The Titanic was to be used for voyages between England and New York. The Titanic was to become the biggest ship of her day. The unique qualities of the vessel deemed her unsinkable were very likely the contributing factors that resulted in her going down. She was built in Belfast Ireland in 1912 at the Harland & Wolff shipyard at a cost of $7.5 million. She weighed 46328 tons and measured 882 and 9" long and 92 and half ft in the beam. Each funnel was large enough for 2 trains side by side to drive through. There were 9 decks and the ship was as high as an 11 story building. 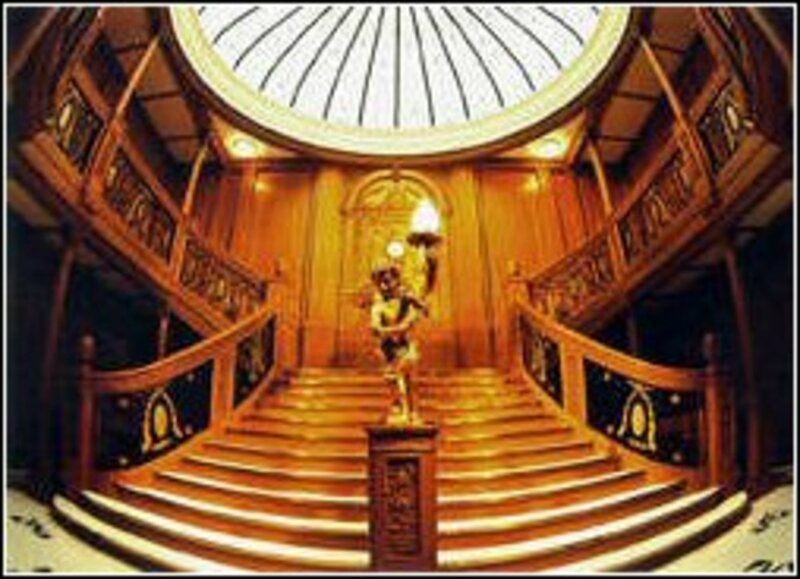 There were 4 elevators, 3 in 1st class , one in 2nd, Titanic was the first Ocean liner to have a swimming pool and a gym. It was constructed with a double hull and 16 watertight compartments, the problem was once one compartment was filled, the water would flow over the TOP to the next compartment. She was designed to stay afloat with any 3 or 4 compartments flooded enabling her to withstand a collision at the joint of any 2 compartments. It was thought that the Olympic class Ocean liners were unsinkable and themselves lifeboats. At the time The British Board of Trade (Regulations?) rule was 16 lifeboats for any ship over 10,000 tons. 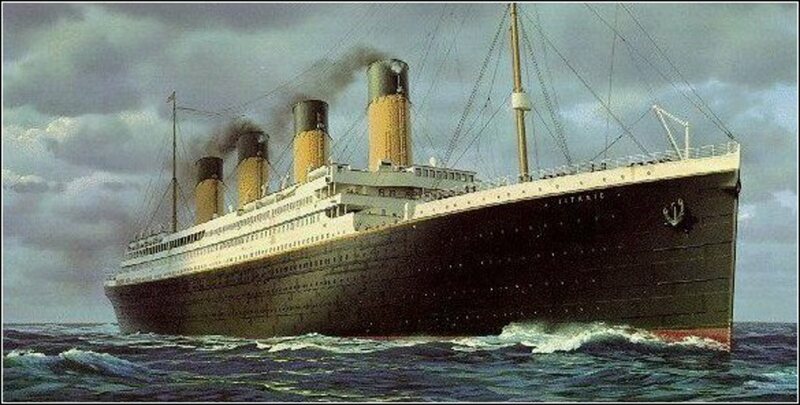 The Titanic carried 20, 16 wooden and 4 collapsibles. The total capacity 1178 people. The theory of the day was that the lifeboats would ferry the passengers (from the sinking ships) to other ships that were always traveling in the heavily traveled shipping lanes. The greatest example of how if anything bad could happen it would. 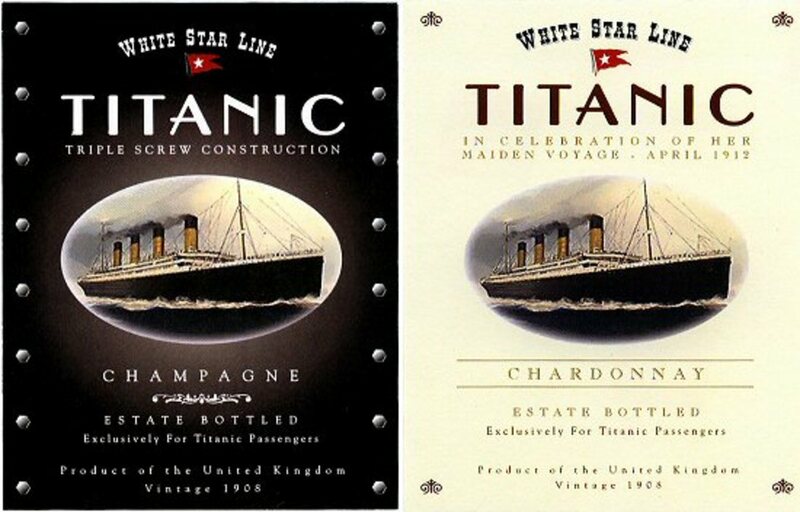 The demise of White Star Line rolled back to the Titanic catastrophe, so that their main rival Cunard could swallow them whole. End of White Star Lines. 1) Normally Icebergs did not float that far South, this was out of the norm. 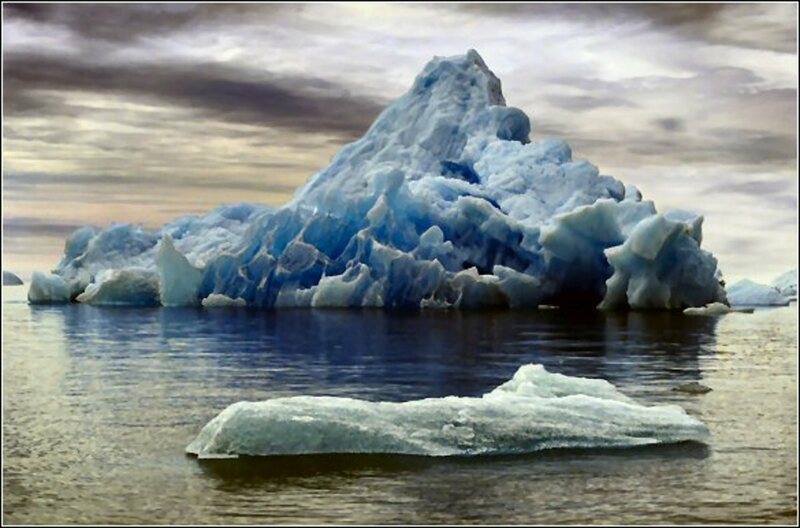 ~~In all of Captain Smith's experience of 30 years, icebergs did not float so far South, this was fluke and not the norm. 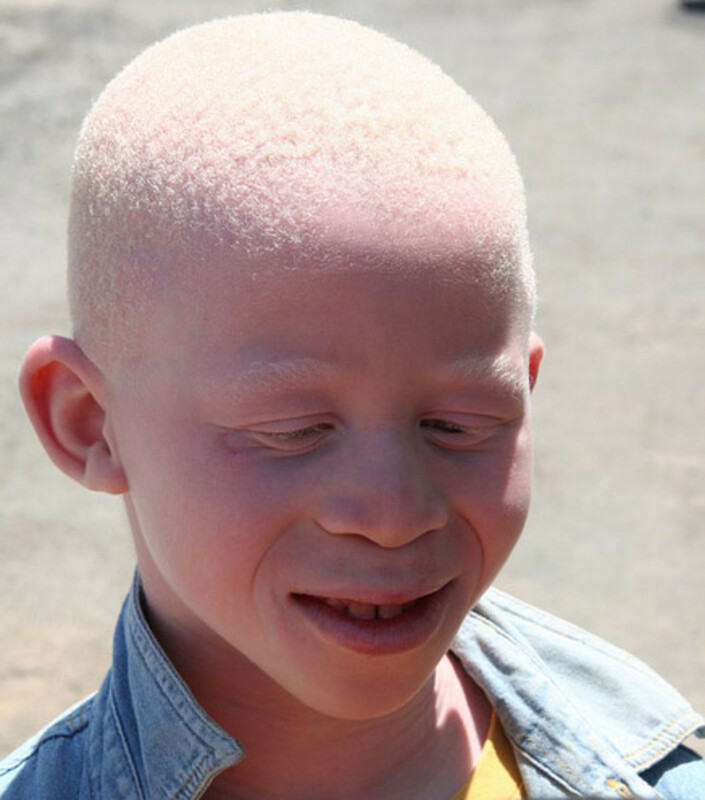 2) She did not see the berg in time. ~~ Binoculars that the post of "Lookout" in the Crow's Nest should have had were missing, left behind in England, lost or stolen. 3) She hit it the way it most vulnerable to her. ~~If the officers had only let it hit head on, a 300 foot gash would not have occurred, compromising 6 compartments with the rate of water filling the vessel beyond ability to save the ship. 4) There weren't enough lifeboats for everybody. 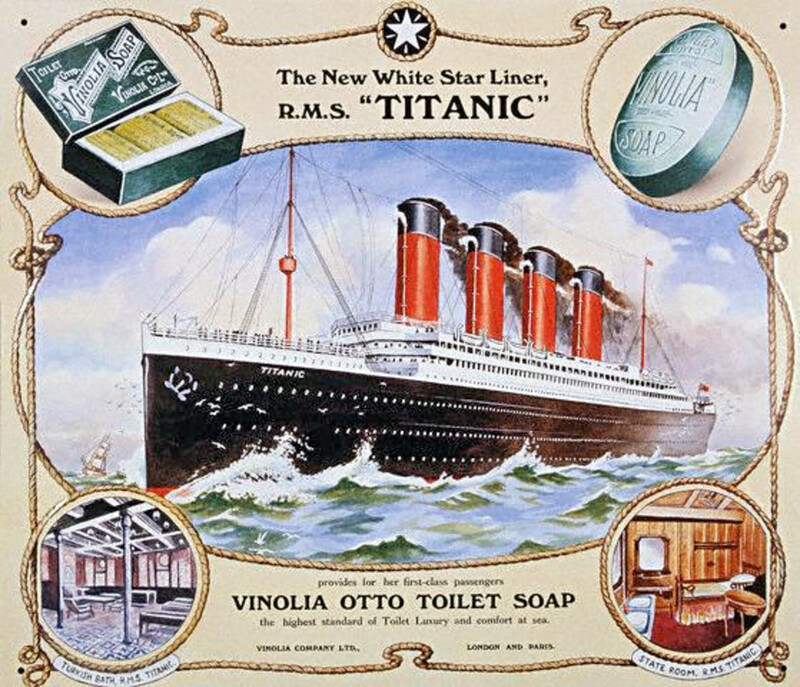 ~~ Titanic carried 20 lifeboats, enough for 1178 people. (only 700 were picked up in the boats)The existing Board of Trade required a passenger ship to provide lifeboat capacity for 1060 people for any ship over 10,000 tons. The boat was designed to carry 32 lifeboats but this number was reduced to 20 because it was felt that the deck would be "too cluttered" cosmetic reasons! 5) They didn't fill the lifeboats. (no lifeboat drills). ~~The British Inquiry questioned why it It took 1 hour after impact to launch the first lifeboat. 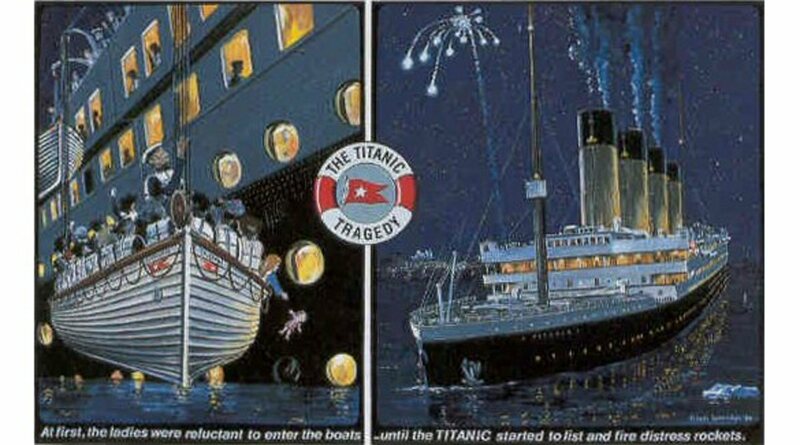 They reacted so slowly to this catastrophe, that there was not enough time to successfully launch all the lifeboats ~~Collapsible lifeboats A and B were not launched but floated away as the water washed over the ship. 6) The nearest ship operator was asleep and did not relay to the California to come for help. ~~This ship was only 10 miles away and could have saved hundreds of lives. 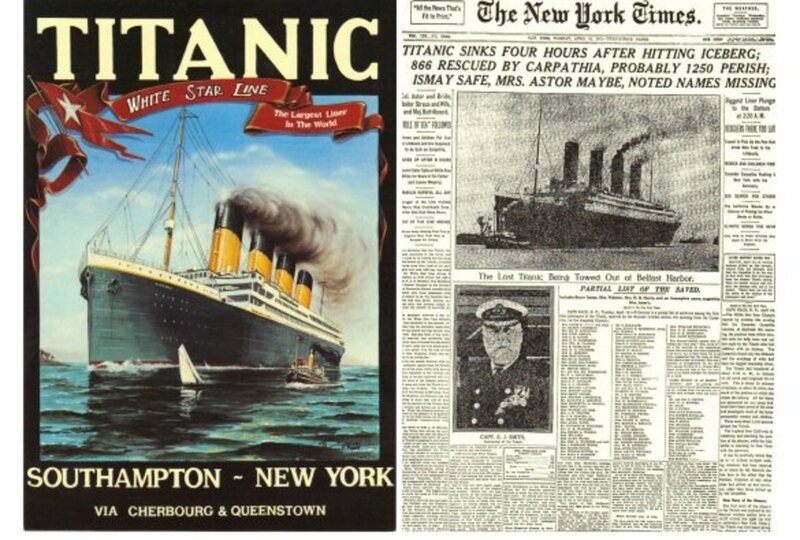 7) White Star Line went into demise ~~ White Star Line Chairman J. Bruce Ismay was incorrectly targeted as the WHO for the Titanic catastrophe even though he was exonerated by both the American and British Inquiries into the Disaster. His request to stay on after the disaster was denied by the Board and this was the Beginning of the End for White Star Line. It spiraled downwards ~~An interesting note is that a desperate plea for help was made to him when he was in his 70s to help White Star Line before its demise and Ismay did try but it was too late. 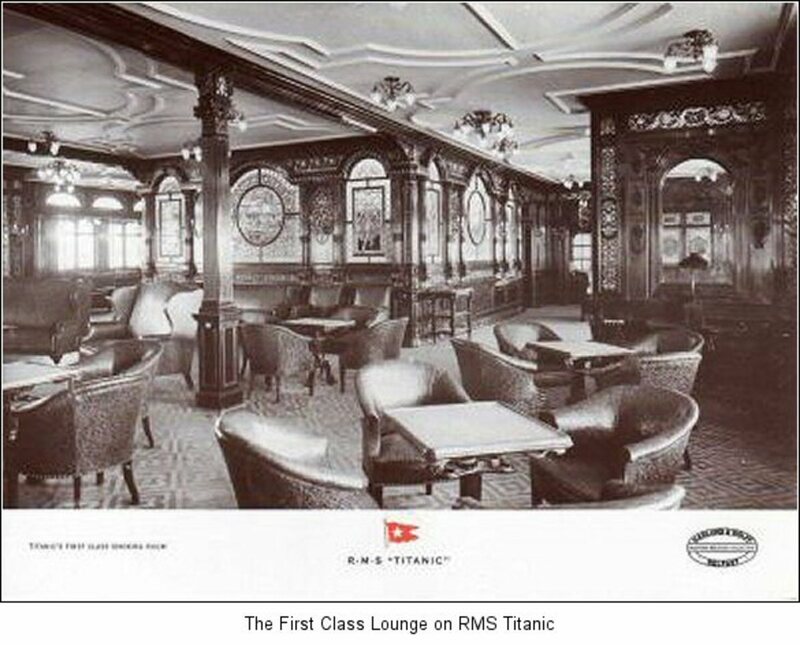 The Titanic had 28 staterooms and suites for her 1st class passengers who mingled on the Promenade deck. The walls were similar to the Palace at Versailles. (Paris) Next door was the reading and writing room for ladies and the smoking room for men. The cost of the journey was $4350 for 1st class and $30 for 3rd class. Even the 3rd class passengers were more luxurious than other ships. 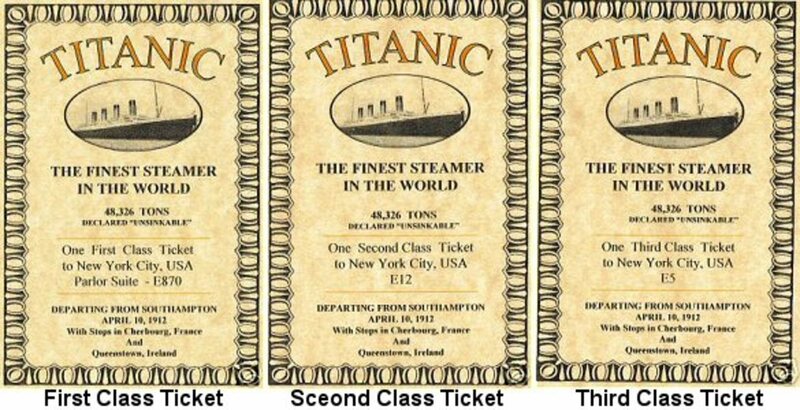 Although due to the position of the 3rd class cabins the 3rd class passengers were trapped below deck during the tragedy. The crew consisted of 860 men and women of which 340 worked below deck. Only a few were officers. She was one of pair a sister ship being built side by side simultaneously ~~ The Titanic and the Olympic. They towered like skyscrapers 15 stories high. 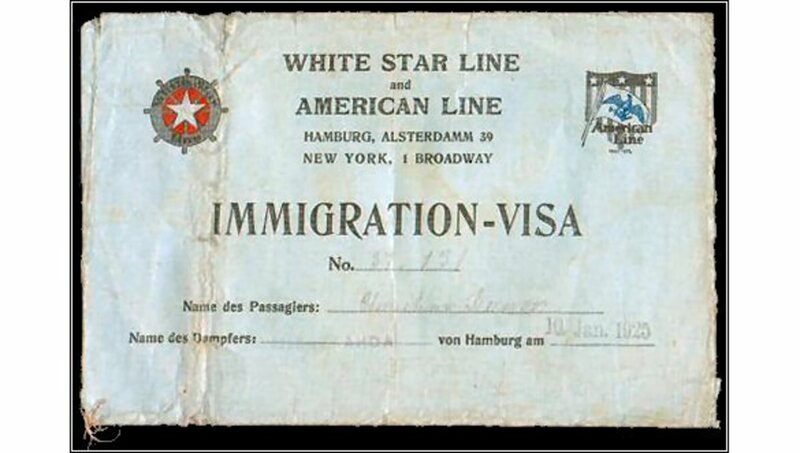 She was there to capture a hefty share of the Trans Atlantic market for White Star to persuade those emigrating from Europe or traveling for business or pleasure to use White Star rather than Cunard. The market was enormous. There were no jets, no planes, and the only way across the oceans was the big ships. She was licensed to carry 3500 passengers. She was to live only 4 days. April 15th: It is now midnight and the start of the next day -- Monday. 12:00 am: The captain is told the ship can only stay afloat for a couple of hours. He gives order to the wireless operators to call for help over the radio. The boilers are shut down and relief pipes against the funnels blow off huge noisy clouds of steam. The Titanic's estimated position: 41Âº 44' N, 50Âº 24' W.
12:05 am: Orders are given to uncover the lifeboats and to get passengers and crew ready on deck. There is only room for half of the estimated 2,227 aboard in the lifeboats. 2:15 am - 2.17 am: Numerous ships receive the Titanic's distress signal, including her sister ship the 'Olympic', some 500 miles away. Several ships, including 'Mount Templestrong>' (49 miles away), 'Frankfortstrong>' (153 miles away), 'Birmastrong>' (70 miles away), 'Balticstrong>' (243 miles away), 'Virginianstrong>' (170 miles away), and 'Carpathiastrong>' (58 miles away) prepare at various times to come to assist. 12:17 am: Third-Class passengers are informed to prepare for the sinking. Crew members bang on doors and shout to wake them up. Meanwhile, First-Class passengers are informed by a gentle knock on the door, and a soothing voice. 12:21 am: Third-Class passengers evacuate their bunks, only to find out that they must wait until the First-Class passengers have finished boarding the lifeboats. 12:22 am: Thomas Andrews arrives at the Boat-Deck and is amazed at the passengers' indifference. While the crew is readying the lifeboats, the passengers are inside drinking brandy or tea while the band plays ragtime. 12:25 am: Captain Rostron of the 'Carpathia' orders a change of course. 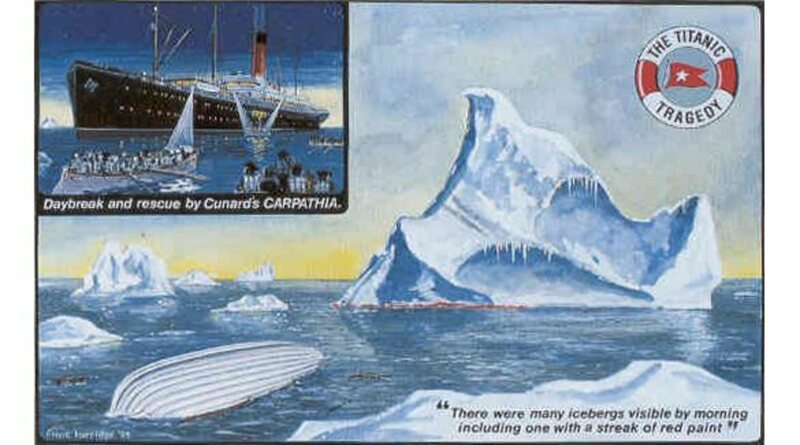 'Carpathia's' wireless sends a message to the Titanic telling them they were on their way. The message was "Coming hard". The 'Carpathia', southeast of the Titanic immediately heads full speed to the rescue. 12:26 am: Lifeboats are now loading with women and children first. 12:27 am: Wireless operator Harold Bride informs Captain Smith that the 'Carpathia' is on it's way to the rescue. 1:15 am: The tilt of the deck grows steeper. Lifeboats now begin to leave fully loaded. 1:40 am: Most of the forward lifeboats have now gone. Passengers begin to move back to the stern area. 2:05 am: The last lifeboat leaves. There are now over 1,500 people left on the ship. The tilt of Titanic's deck grows steeper and steeper. 2:17 am: The last radio call is sent. Captain Smith tells his crew "It's every man for himself". The bow plunges under, many passengers and crew jump off the ship. A funnel collapses, crushing several people. Father Thomas Roussel Davids Byles hears confession and gives absolution to over 100 Second and Third-Class passengers gathered at the aft end of the Boat-Deck. 2:18 am: The ship's lights blink once then go out. Several survivors see the ship break in two. The bow section sinks. 2:20 am: The Titanic's broken off stern settles back into the water, becoming more level for a few moments. 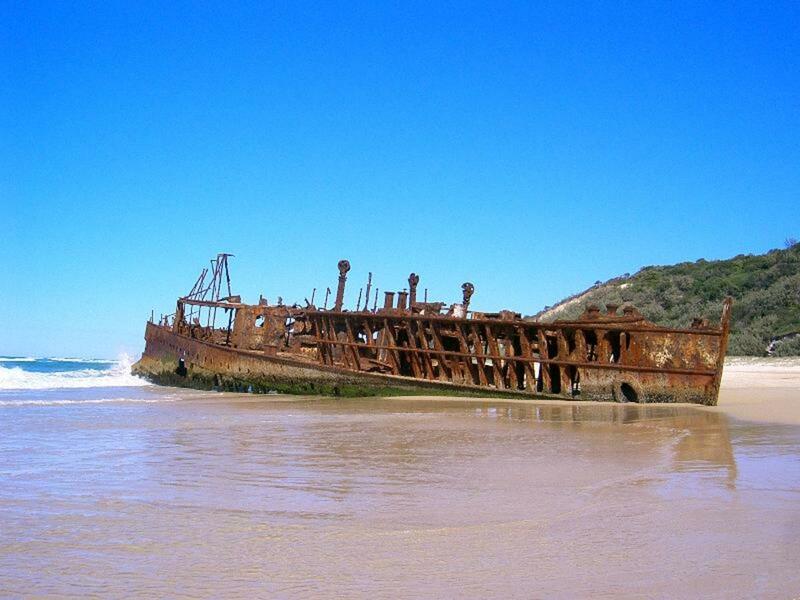 Slowly it fills with water and again tilts its end high into the air before sinking into the sea. People in the water slowly freeze to death. 3:20 am: The final cries of the drowning people in the water fade away. "Hypo" means under, (hence a hypodermic syringe delivers liquid under the dermis - the skin). Normal human core body temperature is 37Â°C (98.6Â°F), clinically hypothermia occurs when the core temperature falls below 35Â°C (95Â°F) - that's not much of a drop. Most Titanic casualties died of hypothermia, not drowning. They froze to death within minutes in the Freezing cold waters of the North Atlantic. Many who were actually in the water reported that it felt like you were being stabbed to death by thousands of knives. Heat is a presence: the rapid vibrating of molecules. Cold is an absence: the damping of the vibrations. At absolute zero, minus 459.67 degrees Fahrenheit, molecular motion ceases altogether. It is this slowing that converts gases to liquids, liquids to solids, and renders solids harder. It slows bacterial growth and chemical reactions. In the human body, cold shuts down metabolism. The lungs take in less oxygen, the heart pumps less blood. Under normal temperatures, this would produce brain damage. But the chilled brain, having slowed its own metabolism, needs far less oxygen-rich blood and can, under the right circumstances, survive intact. Immersion in cold water can quickly numb the extremities to the point of uselessness. Cold hands cannot fasten the straps of a lifejacket, grasp a thrown rescue line, or hold onto an over-turned boat. Within minutes, severe pain clouds rational thought. And, finally, hypothermia (exposure) sets in, and without rescue and proper first aid treatment, unconsciousness and death. Water temperature around Titanic was 28 degrees. 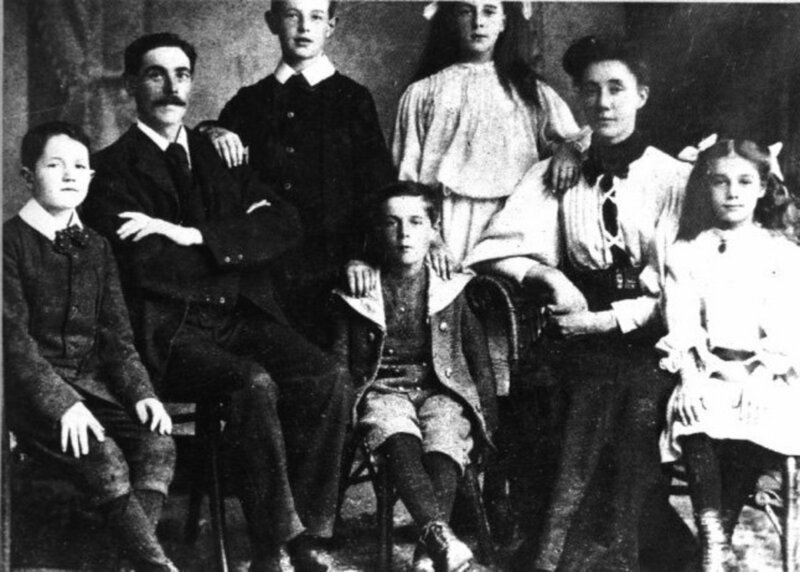 3:30 am: The rescue ship 'Carpathia's' rockets are sighted by survivors in the lifeboats. 4:10 am: The first lifeboat is picked up by the 'Carpathia'. 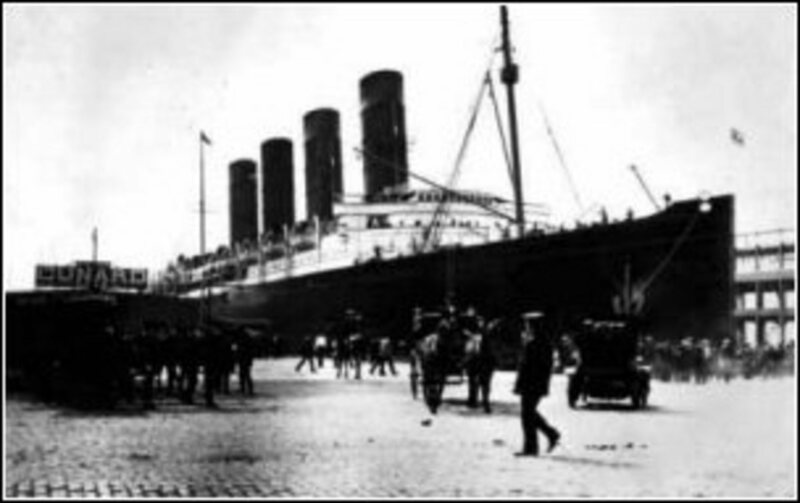 8:50 am: The 'Carpathia' leaves the area bound for New York. She carries 705 survivors. "Deeply regret advise you Titanic sank this morning after collision with iceberg, resulting in serious loss of life. Full particulars later." 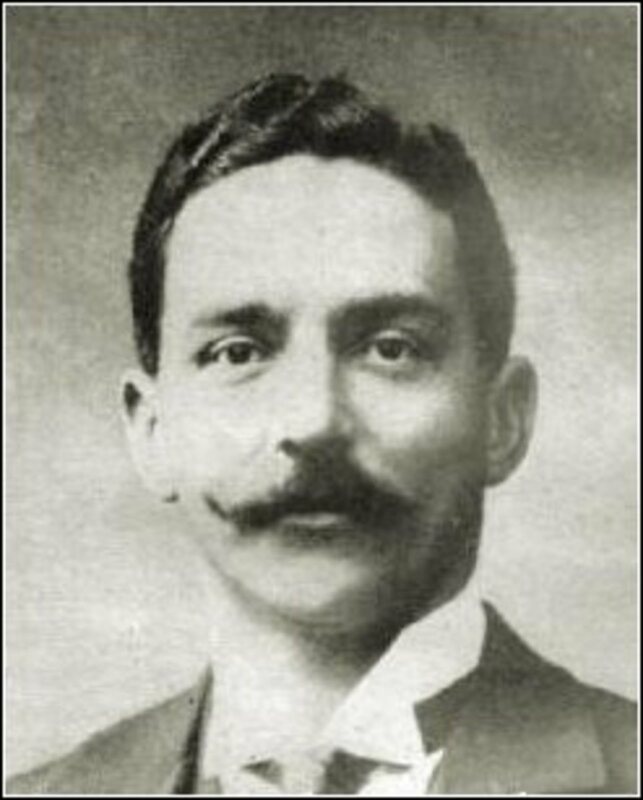 J. Bruce Ismay was chairman and managing director of the White Star Line, and was physically on the Titanic at the time of the disaster. He survived. Some passengers stated that during the voyage they heard Ismay pressuring Captain Edward J. Smith to go faster, in order to arrive in New York ahead of schedule, so as to generate some free press about the new liner. 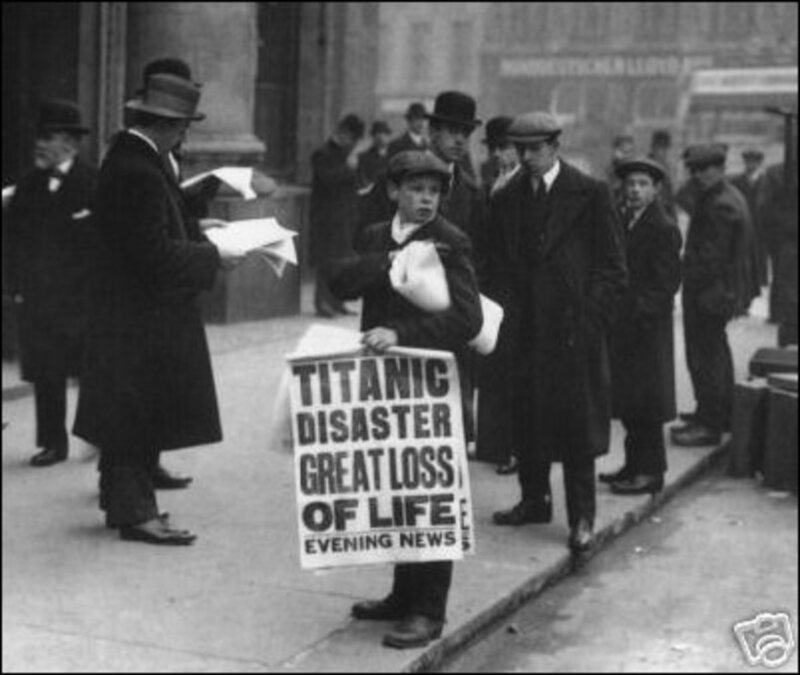 One passenger claimed to have seen Ismay flaunting one of the iceberg warnings at dinner time, waving it around, then placing it back in his pocket. However, these claims are not supported by evidence from any of the surviving officers, and the testimony of some passengers is at best unreliable, and at worst, revealed to be invention. 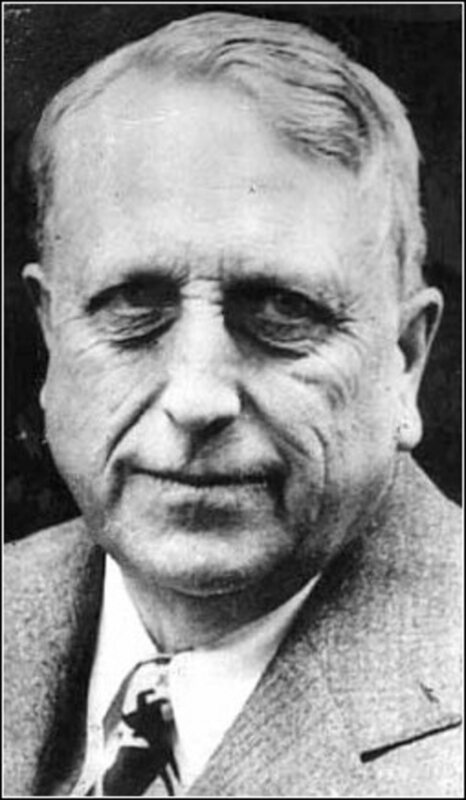 William Randolph Hearst, a newspaper magnate and one of the richest and most powerful men in America at that time. At the peak of his fortune in 1935, he owned 28 major newspapers and 18 magazines, along with several radio stations, movie companies, and news services. Hearst hated minorities, and he used his chain of newspapers to aggravate racial tensions at every opportunity. Hearst especially hated Mexicans. Hearst papers portrayed Mexicans as lazy, degenerate, and violent, and as marijuana smokers and job stealers. The real motive behind this prejudice may well have been that Hearst had lost 800,000 acres of prime timberland to the rebel Pancho Villa, suggesting that Hearst's racism was fueled by Mexican threat to his empire. Hearst created an ongoing vicious campaign blaming J. Bruce Ismay, printing vicious cartoons and asking for the name of "White Star: to be changed to "Yellow Liver". Hearst used his influence to attack real and imagined enemies. He attacked maliciously and was kept careful controlled by his psychiatrist in Beverly Hills until his death at 88. He disinherited his sons and died withdrawn from society, a miserable old man, an ironic poetic justice for the lives he tried to destroy. Expect to see Titanic in a whole new light. Unlike traveling exhibits, Titanic Branson is a permanent two-story museum attraction shaped like Titanic! In 1897, the German liner Kaiser Wilhelm der Grosse became the largest and fastest ship in the world. The Cunard Line always sought the prestige and glory of superlative ocean travel back not only to the company, but also to Great Britain. In 1903, Cunard Line and the British government reached an agreement to build two superliners, the RMS Lusitania and RMS Mauretania, which would be not only the fastest ships in the world, (to outdo German Nautical superiority) but also to have the largest and the most luxurious fleet of all. The British government were to lend Â£2,600,000 for the construction with a stipulation that the ships could be converted to Armed Merchant Cruisers if needed. The Admiralty could requisition the ships for use by the British Navy in any time of war. Cunard launched two ships, the RMS Mauretania and the RMS Lusitania. 30,000 tons. A new generation of ships had been born which out classed the four large White Star line vessels. RMS Lusitania was a British luxury ocean liner owned by the Cunard Steamship Line Shipping Company and built by John Brown and Company of Clydebank, Scotland. Christened and launched on Thursday, June 7, 1906, RMS Lusitania met a tragic end as a casualty of the First World War when she was torpedoed by the German submarine, U-20, on May 7, 1915. On her second crossing of the Atlantic, the RMS Lusitania took the Atlantic Speed Record for Britain averaging a speed of 23.99 knots, nearly seven knots faster than any White Star Ocean Liner. RMS Mauretania (also known as "Maury"), sister ship of the RMS Lusitania, was an ocean liner built by Swan, Hunter & Wigham Richardson at Wallsend, Tyne and Wear, and was launched on September 20, 1906. At the time, she was the largest and fastest ship in the world. The Oceanic Steam Navigation Company, more commonly known as the White Star Line, was a prominent British shipping company. 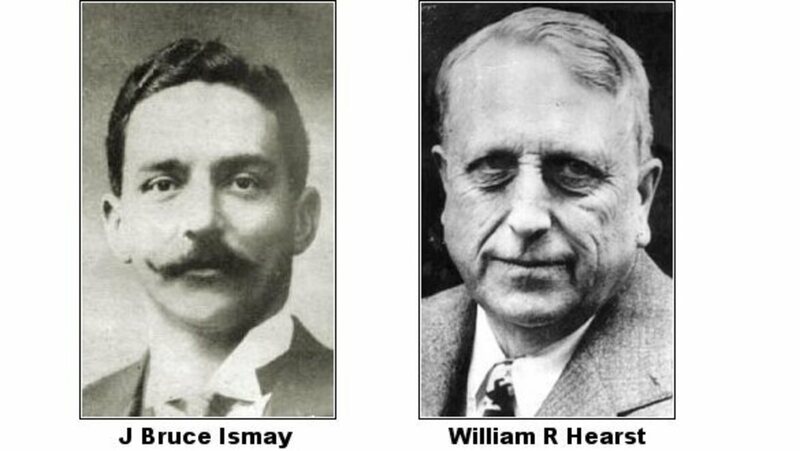 The President of the company was J. Bruce Ismay. Their head office was just off Trafalgar Square called "Oceanic House". It is a gigantic structure and is still there today. Their Biggest competitor was the Cunard Line. Around this, time American financier J. P. Morgan's International Mercantile Marine Co. was attempting to monopolize the shipping trade, and had already acquired a tangled financial interest in White Star. J. Bruce Ismay had a competitive spirit. He had ambition. He had vision and an urge for his company, the White Star Line to be #1. Ismay had an ongoing desire to take his company to a higher level with bigger, more luxurious and fast ships and to outshine CUNARD. 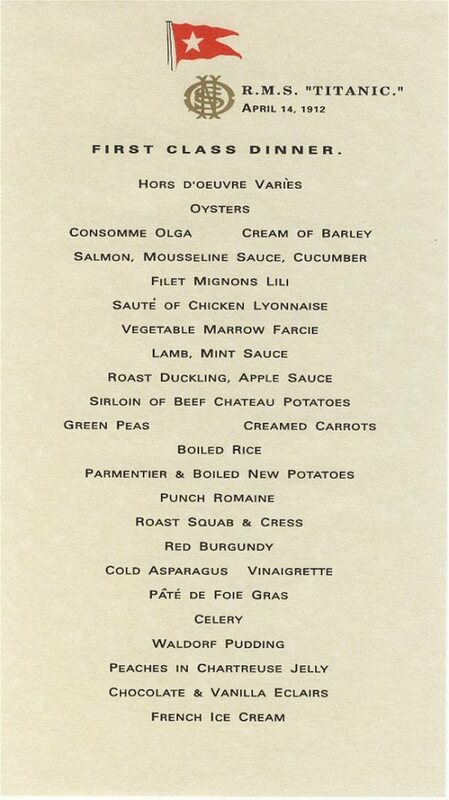 It was at this dinner in Belgrave Square (walking distance from where I was born and raised!) 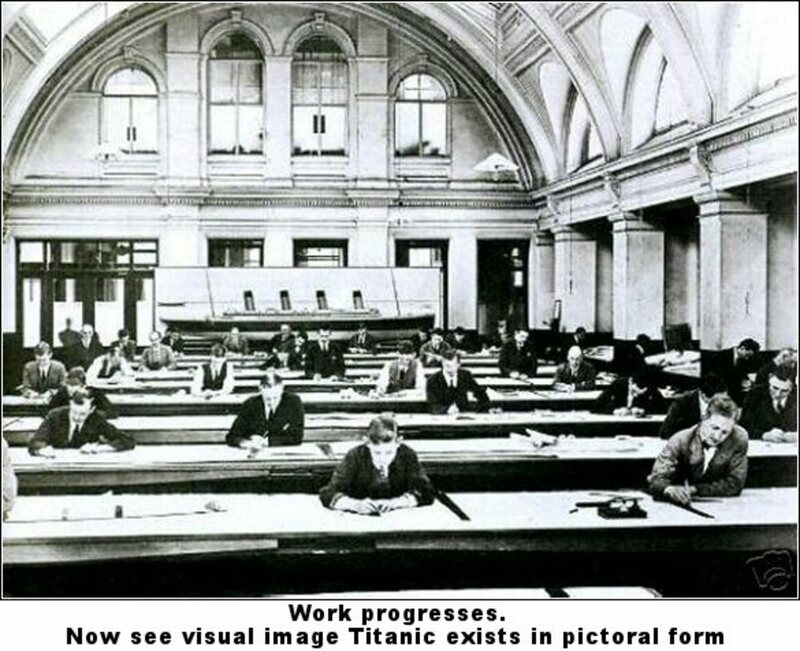 that the IDEA of RMS Titanic was born. The RMS Olympic and the RMS Titanic and the RMS Gigantic would be nearly one and a half time larger than RMS Mauretania and the RMS Lusitania with a higher nautical speed ~~ As a result, these three ships would make the White Star Line again the shipping company with the biggest, most luxurious and fastest ships in the world. All 3 ships would be built by Harland & Wolff, shipbuilders, in a pact of loyalty and solid agreements. 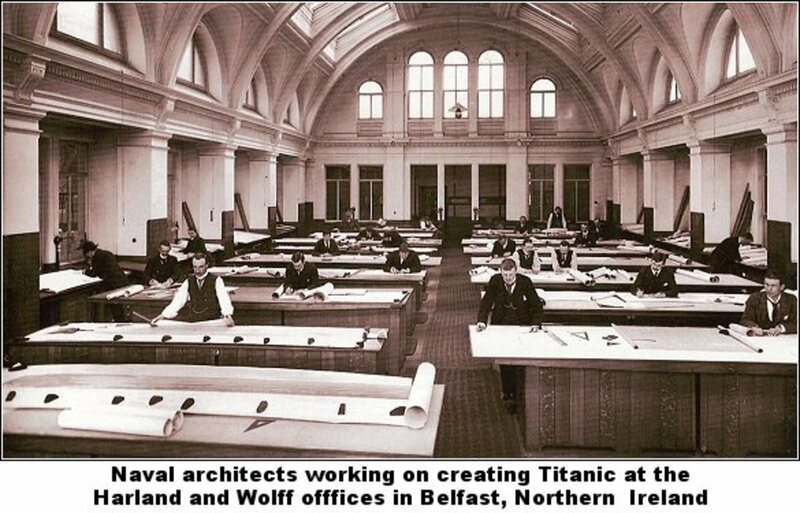 Harland & Wolff would build the ships to their own specifications, sparing no expense, they would then tack on a fixed percentage to the building cost to constitute their fee. Further agreement stated that Harland and Wolff would never build a ship for any of White Star's competitors, and at the same time, White Star would not contract with any rival shipbuilders. The sweetheart deal worked well for both parties. 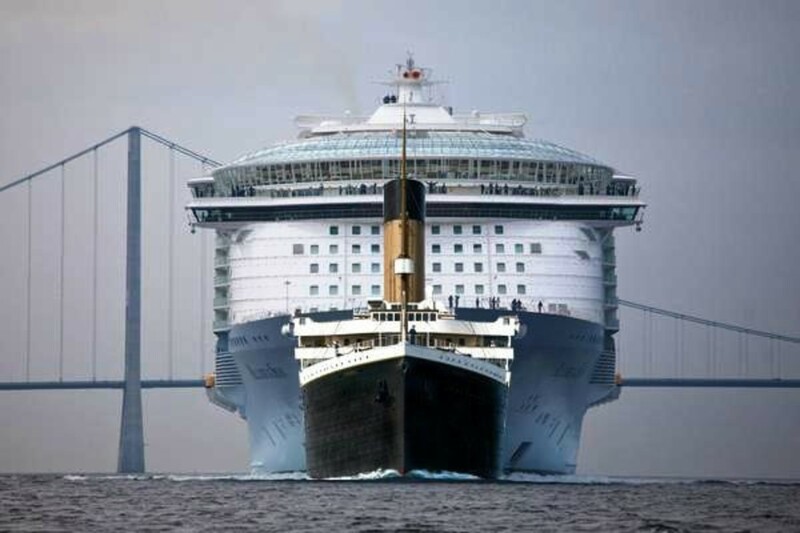 The decision was made to build 2 sister ships built side by side simulatenously ~~ The RMS Titanic and the RMS Olympic. They towered like skyscrapers 15 stories high. She was there to capture a hefty share of the Trans Alantic market for White Star to persuade those emmigrating from Europe or traveling for business or pleasure to use White Star rather than Cunard. The market was enormous. This was the turn of the century~~There were no jets, no planes, and the only way across the oceans was the big ships. Courtesy Mystic Aquarium and Institute for Exploration. Dr. Robert Ballard is leading a scientific expedition to learn how the Titanic wreckage has changed in the nearly 20 years since he discovered it. 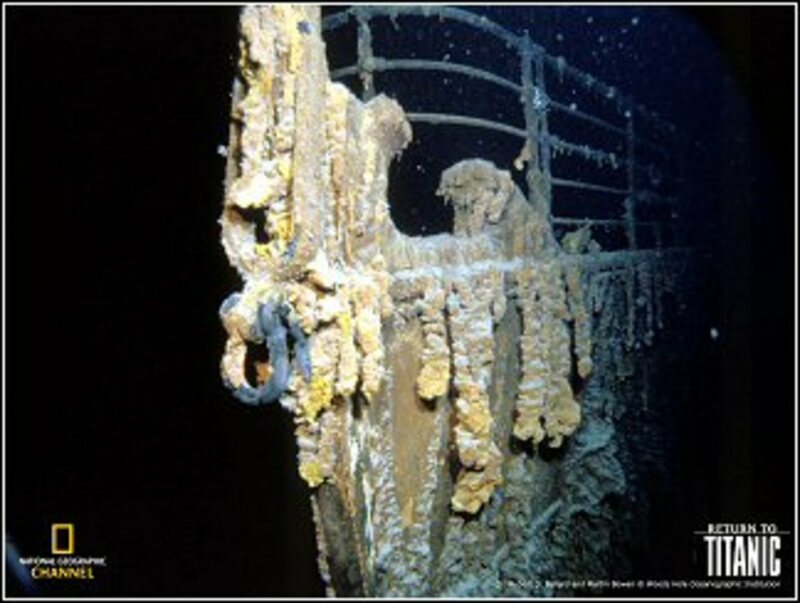 The Titanic's bow railing, in a photo from a previous expedition. 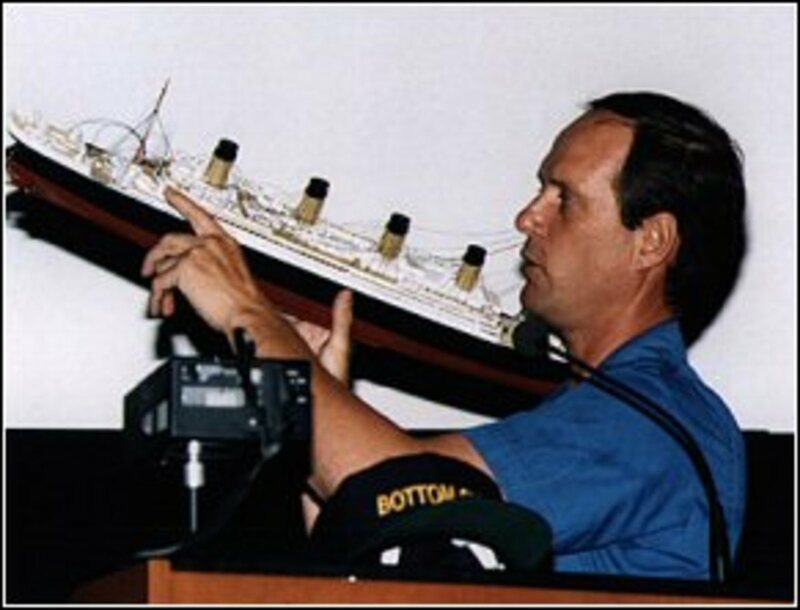 Morning Edition, June 3, 2004· Dr. Robert Ballard returns to explore the Titanic, 19 years after he first located the world's most famous shipwreck. 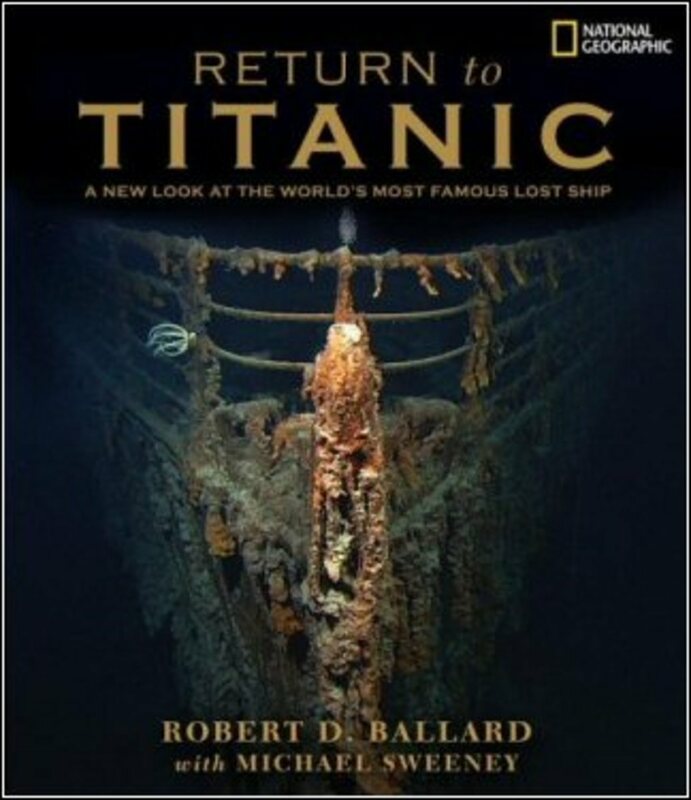 On Monday, Ballard's expedition will be featured in a National Geographic Channel special, Return to Titanic. With new technology, including improved robotic subs, high-definition cameras and better lighting, Ballard says large sections of the sunken ocean liner are coming into view that weren't visible in his previous expeditions in the mid-1980s. "It's very majestic," Ballard tells NPR's Steve Inskeep. But over the years the Titanic has been damaged -- by submarines that have visited the site, by the removal of artifacts and by natural erosion. Ballard says he hopes his latest expedition brings attention to the problem of shipwrecks being stripped by salvagers. "The deep sea is the biggest museum in the world... yet there's no lock on the door," he says. 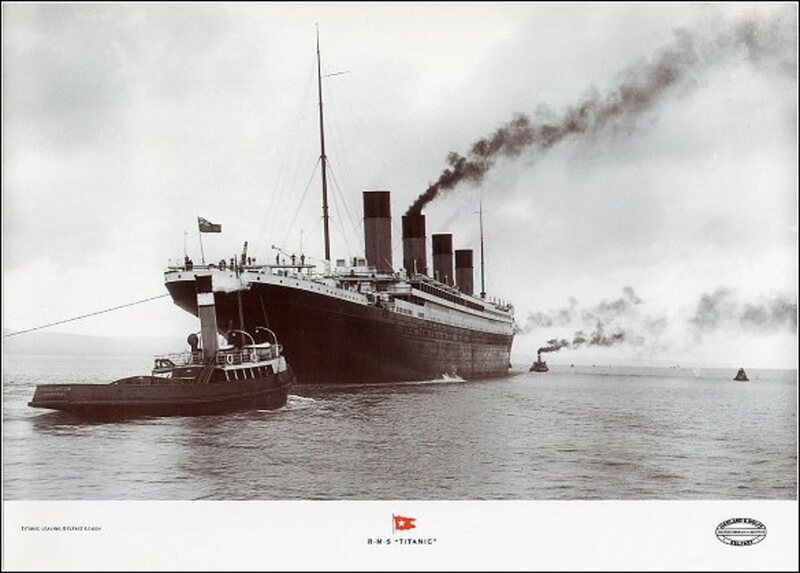 My first direct view of Titanic lasted less than two minutes, but the stark sight of her immense black hull towering above the ocean floor will remain forever ingrained in my memory. My lifelong dream was to find this great ship, and during the past 13 years the quest for her had dominated my life. Now, finally, the quest was over. In a way I am sad we found her. After 33 hours of exploring her dismembered hulk, we know her fate, and it is not a pretty sight. Though still impressive in her dimensions, she is no longer the graceful lady that sank a mere five days into her maiden voyage, in 1912, after striking an iceberg. Her beauty has faded, her massive steel plates are dissolving in rivers of rust, and her ornate woodwork has been devoured by an army of countless wood-boring organisms whose hollow calcium tubes now litter her barren shape. After years of gluttony the creatures starved and dropped dead at the table. I have no sympathy for them; they robbed Titanic of her last touch of elegance. How long Titanic will remain more or less intact? "Some people think the bow will collapse in a year or two," Lange said. "But others say it's going to be there for hundreds of years." "We're trying to bring the actual hard data to the people who can make those determinations," Lange said. Join world-renowned undersea explorer Dr. Robert D. Ballard for an extraordinary adventure to the final resting places of legendary ocean liners and ghostly warships. In 1985 Ballard discovered the most famous ship of all, the Titanic, and since then he's explored her sister ship Britannic, the Lusitania, the Andrea Doria, and Hitler's most famous battleship, the Bismarck. 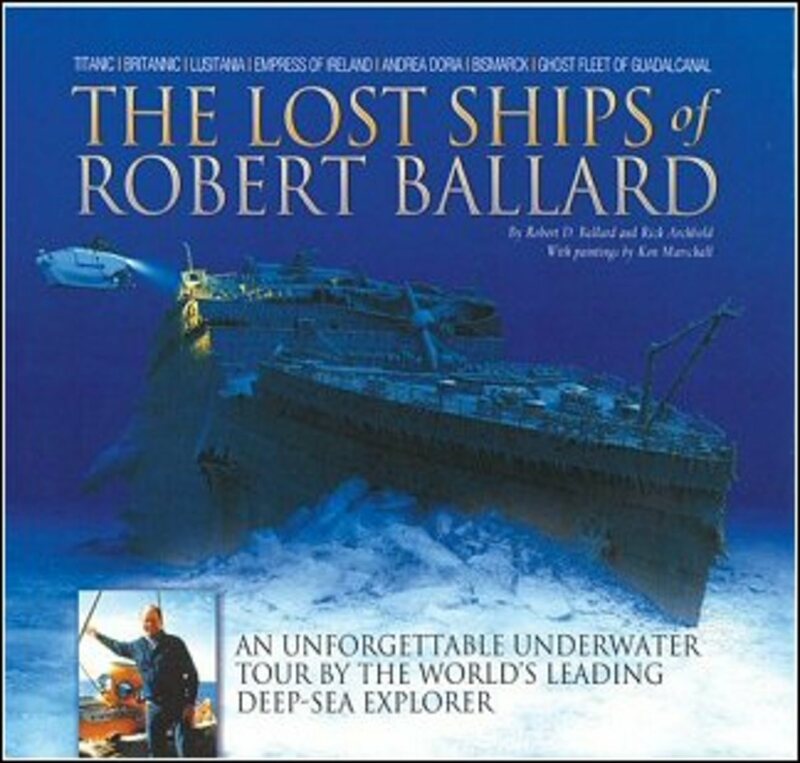 In this comprehensive volume, Ballard gives a guided tour of these ships and others, retelling their harrowing stories, and revealing the sunken secrets locked inside their ghostly wrecks. High-tech underwater photography, archival photos, illustrations and memorabilia recall the splendor of these magnificent vessels, thought at one time to be 'unsinkable.' There is also an exploration of the Pacific's greatest battlefield-Iron Bottom Sound-and the lost ships of Guadalcanal. Titanic's short life of only 4 days on her Maiden Voyage before sinking is imbedded in the human psyche. Before announcing development of this film, director James Cameron shot footage of icebergs off Nova Scotia under the pretence of making a film called "Planet Ice." When James Cameron decided to include real footage of the Titanic's remains on the seabed, he did not want to simply shoot from inside a submersible as had been done for the IMAX documentary Titanica (1995). To allow filming from outside the sub, Cameron's brother Mike Cameron and Panavision developed a deep-sea camera system capable of withstanding the 400 atmospheres of pressure at that depth. The deep-sea camera held only 12 minutes' worth of film, but each dive took many hours. To make the best use of his resources, James Cameron had a 1/33 scale model of the wreck constructed and used it to rehearse each dive. The Russian sub operators would walk around the model ship holding model subs in their hands as Cameron explained the shots he wanted. 12 dives were necessary. On the last two dives, shots were taken by sending a remotely operated vehicle into the wreck; James Cameron had intended using this device only as a prop. 324 1st class passengers, 201 survived. 277 2nd class passengers, 118 survived. 708 3rd class passengers, 181 survived. Total: 1,219 on board, 500 survived. Total: 898 on board, 212 survived. Grand total: 2,207 on board, 712 survived.